It's Day One of the DNC. Among the prominent speakers tonight are Michelle Obama,Bernie Sanders and Elizabeth Warren. Debbie Wasserman Schultz of Weston, chairwoman of the Democratic National Committee, will not open the convention (she resigned this weekend.) The opening, at 4pm, will be done by Baltimore Mayor Stephanie Rawlings-Blake, secretary of the Democratic National Committee. The Denver Host Committee, under a contractual deadline to raise $40.6 million by today for the Democratic National Convention in August, has confirmed it fell $11.6 million short of that amount. So, what now? Barack Obama has raised $265 million for his campaign so far. Will he now assist the Host Committee in obtaining contributions for the convention? The Obama campaign has broken all political fundraising records largely by mining the Internet for small contributions, collecting some $265 million. A fundraising pitch to those donors could vastly boost the convention's fundraising, several observers said. "There are discussions occurring. We could definitely use the help of the Obama campaign," said Steve Farber, a Denver lawyer and leading member of the host committee. "The fact that we have a candidate now does help." Obama needs 471.5 of the 875 remaining delegates, or 53.9%, in order to reach the magic number. Clinton needs even more, 489.5 of 875, or 56.0%. Both scenarios are extremely unlikely. Those numbers are very close to each other. Put another way, Hillary is only 18 delegates behind Obama in the race for the next 875. Hillary Clinton released a statement today asking her delegates to support the seating of the Michigan and Florida delegates at the DNC in Denver. She also says she will abide by the no-campaign pledge the candidates signed and expects the other candidates to do so as well. "I believe our nominee will need the enthusiastic support of Democrats in these states to win the general election, and so I will ask my Democratic convention delegates to support seating the delegations from Florida and Michigan. I know not all of my delegates will do so and I fully respect that decision. But I hope to be President of all 50 states and U.S. territories, and that we have all 50 states represented and counted at the Democratic convention. "I hope my fellow potential nominees will join me in this. The DNCC is hosting the first media walk-through for the Democratic National Convention in Denver tomorrow. Events kick off in an hour with a reception at the Wynkoop Brewery. Tomorrow is the walk-through. I'll miss some of it as I have early court in the morning. But I will be there to hear Howard Dean for lunch. Democratic National Committee (DNC) Chairman Howard Dean will address members of the media attending the 2008 Democratic National Convention Fall Media Walk-Through during a luncheon at 12:00 p.m. MT on TUESDAY, November 13, 2007, at the Pepsi Center in Denver. The Media Walk-Through is being organized by the Democratic National Convention Committee (DNCC). ...Governor Dean will address members of the media from international, national, local and online outlets planning their coverage of the 2008 Democratic National Convention. This should be fun. More details when I return. 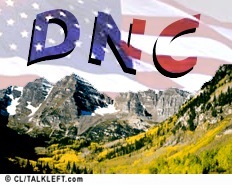 Patrick Doyle of Denver's premier monthly magazine 5280 takes a long look at what holding the Democratic convention in the Denver means for Democrats winning the West in 2008. It's good news. By holding their convention in Denver, they’ve signaled to the country that they’re marching, knees high, into the West. It’s a bold move, and it’s long overdue: The last time the Dems held a convention in Denver was 1908, and it’s been 80 years since they held a convention west of Chicago or east of California. Over the next six pages, we’ll look at what the West means to the political left. Woo-hoo! Via the National Journal Hotline, Howard Dean and the DNC have chosen Denver to host its 2008 national convention. A Democrat who was briefed said that chairman Howard Dean made the final decision yesterday, weeks later than planned. DNC comm. dir. Karen Finney declined to confirm the choice. Colorado is a marquee states for Democrats, who have, in the past two years, gobbled up the governor's mansion, control of the state legislature, and two congressional seats. More from the Denver Post. The decision will be announced this afternoon.